Oak has long been a favorite hardwood for furniture and cabinet making. Along with cherry and maple, it is considered one of the classic hardwoods for fine furniture. Well known for its density and hardness, Oak provides a high degree of strength, along with beautiful grain contrast and patterns. Due to the high cost of oak, along with the difficulty in working with it, oak plywood is very popular for cabinet and furniture making. With solid wood edging applied to the oak plywood, it provides the same beauty as solid boards, while reducing material cost, guaranteeing flatness of panels and providing for easier workability. As with other hardwood plywood, all oak plywood is graded in two different ways: first of all, it is graded for the quality of the veneer finish and secondly it is graded for the type of core. 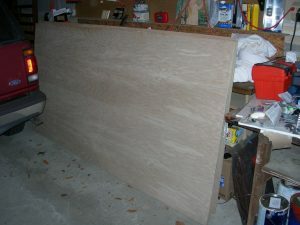 Oak plywood is considered “good” on both veneered sides, although there is one side that is distinctly the face side, leaving the other to be the back side. The face side is graded from “A” to “D”, with A being the finest quality. The back side is graded with numbers, from “1” to “4.” For cabinetry and furniture, grade “A2” is the most commonly used; although grades B and C are often used for internal shelving and cabinet backs. More about visible and back face grades is presented in the chart at page about cabinet grade plywood. Lower grades are basically considered paint grade. The face veneer on oak plywood can vary greatly in thickness, depending upon the manufacturer and their commitment to quality. While most veneers used in plywood are rotary cut, veneers used on quality oak plywood and other hardwood plywood are plain sliced, giving the appearance of oak boards laminated together. The highest grades of oak plywood have bookmatched veneers on the face but also highest prices. The biggest difference between the various grades of oak plywood is the core. While softwood plywood always has a number of layers which are laid 90 degrees to each other; hardwood plywood can have any material between the face and back veneers. Therefore, oak plywood comes either be veneer cored, like softwood plywood, or it can be “solid core” particleboard or MDF (Medium Density Fiberboard). While the veneer core is structurally stronger, particleboard and MDF provide for a more stable, flatter sheet with a more consistent thickness. The loss of structural strength in particleboard and MDF core oak plywood is essentially caused by the lower screw pullout strength inherent in these materials. 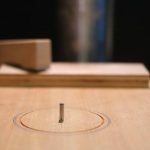 However, in most cases where oak plywood is used, the panels are edged with solid oak hardwood, insuring that there is sufficient strength for mounting hardware and connecting panels together. The problem with veneer core oak plywood is that any imperfections in a layer of the core will affect the adjacent layers. If the imperfection is large enough or close enough to the face veneer, the imperfection will show in the finish of the cabinet. Unfortunately, this normally doesn’t show up until after finishing. Due to these incongruencies with veneer core oak plywood, the Architectural Woodwork Institute Quality Standard prohibits the use of veneer core oak plywood for cabinet doors and other specific items in the highest grades of cabinetry. The quality of the finish is considered important enough to override any loss in structural strength caused by using particle board or MDF core oak plywood.